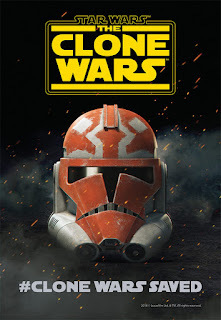 Idle Hands: SDCC 2018: Star Wars: The Clone Wars Animated Series Returns!! SDCC 2018: Star Wars: The Clone Wars Animated Series Returns!! As the biggest companies scramble to gather exclusive content for their streaming services intended to give Netflix a run for their money, Disney just pulled out an ace in the hole. THE CLONE WARS: THE ANIMATED SERIES IS RETURNING!!! During a celebration of the 10th anniversary of the now legendary series at San Diego Comic-Con 2018, Dave Filoni (the man who should take the reigns on the entire Star Wars film universe) announced the show would return with 12 all new episodes set to air on Disney's direct-to-consumer streaming service, bringing closure to the unfinished work and its millions of fans worldwide.